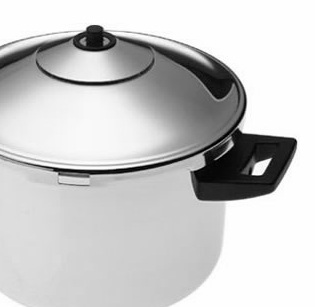 Cooks hip to the benefits of pressure cooking, and shopping for their first cooker often ask me if there is any difference between stove top and electric pressure cookers. Here’s a cooker-to-cooker comparison of the differences and similarities, between stove top and electric pressure cookers. While electric pressure cookers require almost no monitoring to bring, maintain and release pressure, it takes them more time to get there (see “the mechanics”, below, for details). But if you can leave the house while an electric pressure cooker is running, does the extra time it takes to reach and loose pressure really matter?!? Through years of use and interacting with readers of the website and in-person demonstrations, I’ve narrowed down how to match a pressure cooker type to a cook. Which of these most closely match your cooking prowess and life style? Electric pressure cookers are best for..
expert cooks who have already moved all of their cooking to pressure and often have more than one stovetop cooker running – an electric is a great addition to the ensemble. Stove top Pressure Cookers are best for..
cooks who like to tinker and supervise the cooking since the pressure releases faster than electrics. Most stove top pressure cookers have two, or more pressure settings. “High Pressure” which is typically 13-15 PSI and “Low Pressure” which is 6-8 PSI.This is the “standard” pressure range and most cookbooks write their recipe timing based on this range. Pressure selection is achieved by either using dial that points to 1 (low pressure) or 2 (high pressure), or a marked bar that slowly raises from the cooker while it is reaching pressure – the first mark indicates low pressure, the second mark indicates high pressure. Electric pressure cookers have a varied maximum pressure between manufacturers and models. Depending on the model one could reach only 6 PSI, while other models could reach 8, 9, 10, 11 or 13psi – some claim to cook 15psi though we have not found this to be true. Some have only one pressure setting, others have two. This means that the pressure cooking time will take longer in an electric vs. a stovetop pressure cooker to achieve the same results. The cook needs to adjust heat while the stovetop pressure cooker is reaching pressure. When first learning to use a pressure cooker, it may take a few tries for the cook to discover the exact heat setting to keep the cooker from going into over-pressure or losing pressure. This process can take up to 15 minutes of the cook’s attention before the pressure cooking process even begins. More Info: How to Use a Stovetop or Electric Pressure Cooker The heat regulation for electric pressure cookers is completely automated. The cook need only select the desired pressure, or program, and cooking time and hit “start”. The cook does not even need to be there while the cooker is building pressure and pressure cooking. Stovetop pressure cookers are, on average, about three times faster than conventional cooking. More Info: Stovetop and Electric Pressure Cooker Cooking Times Electric pressure cookers are, on average, about twice as fast as conventional cooking. Generally, stovetop pressure cooker take a little less time to release pressure. Normal Release – about 2 minutes. Natural Release – about 10 minutes. Additional feature-specific releases may be available on some models.More Info: Pressure Cooker Opening Methods Generally, electric pressure cookers take more time to release pressure. The natural release takes more than twice as long. Normal Release – about 3 minutes. Natural Release – about 25 minutes. Most stove top pressure cookers do not have an integrated timer though they are becoming more popular. Typically, these cookers require a separate timer to keep track of cooking time while the cooker is at pressure. Stove top pressure cookers have no cooking programs or scheduling features (although more and more are coming out with their own apps). If used in conjunction with an induction burner, the timer on the burner can semi-automate a stovetop cooker. All modern electric pressure cookers have an integrated timer to keep track of cooking time while under pressure. The most modern electric pressure cookers, feature micro-computer controlled smart cooking programs that interact with a pressure sensor and thermostat. Most electric pressure cookers allow for scheduling and delayed start for up to 12 hours, depending on the model, for meals that do not contain meat, diary or other ingredients that must remain refrigerated. 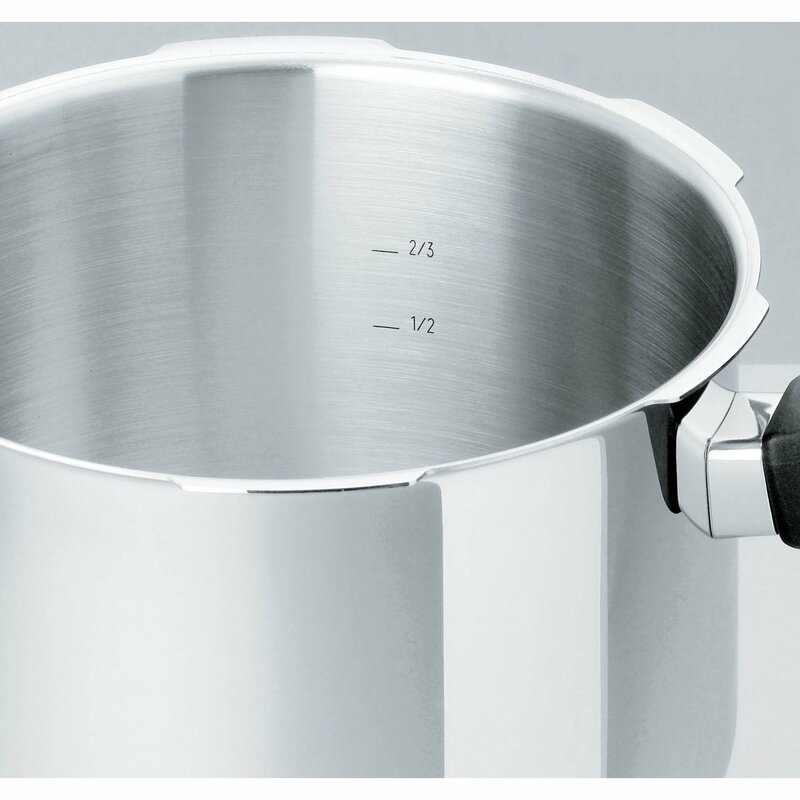 The base of stove top pressure cookers can be used as a normal cooking pot, without use of the pressure cooking lid. Larger models, such as the ones that are 10 L/qt, or larger, can be used for pressure canning low-acid foods (such as meat, vegetables and soups). More Info: Pressure Canning Guide & FAQ Electric pressure cookers cannot be used for regular cooking without pressure – though newer models include “saute'” function which allow browning in the cooker without the lid.Many electric pressure cookers also include slow-cooker and other multi-cooker functions (including one that makes yogurt!). But, despite what some manufacturers might say, you cannot pressure can in an electric pressure cooker. A stovetop pressure cooker can be stored with regular pots and pans. An electric pressure cooker needs counter-space and is bulky and tall – making it difficult to store in a cupboard. Also, when in use, the cooker should not be under an over-head cupboard. However, it can replace several other electric appliacnes. Stovetop pressure cookers can be used on gas, electric, halogen, induction, ceramic and glass cooktops. Can also be used on camping stove or BBQ. Electric pressure cookers have can only run on electricity. 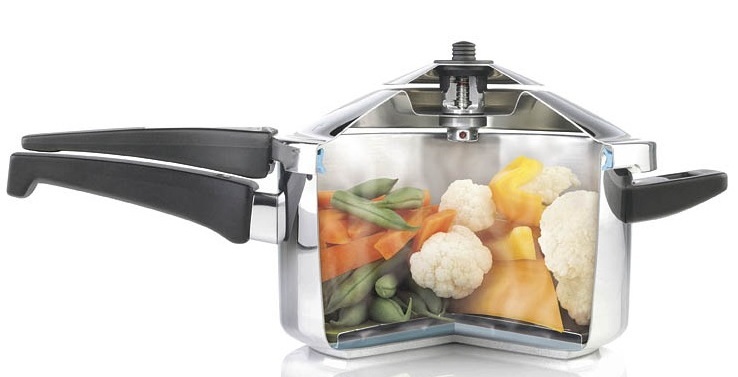 Stove top pressure cookers are available in aluminum and stainless steel. Stainless steel cookers are extremely durable and very difficult to damage and often last 20 or more years. 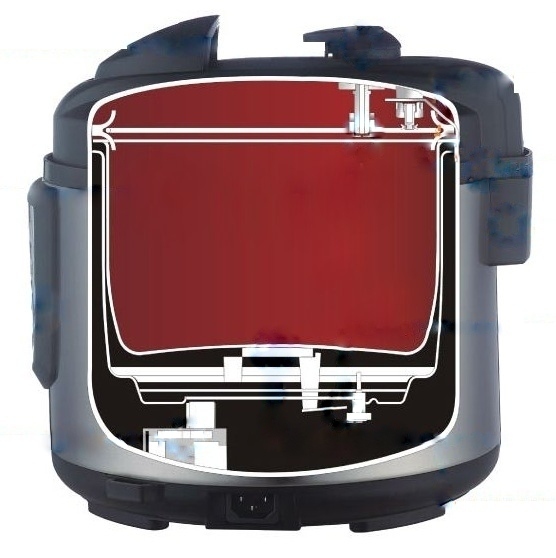 The outer casing of all electric pressure cookers is made of thermal-resistant plastic. Some have better electronics than others. The interior liner is most often-made of aluminum with a non-stick coating. The cook must use caution when using utensils, accessories and even “pointy” food (such as cut bones) which may scratch the interior coating. However, today more and more models are coming out with stainless steel (pictured) and anodized aluminum and ceramic-coated interiors. Cooks have reported electronic failures within the first three years of use. During the course of use gaskets and other silicone parts may need to be replaced. They can be purchased from the manufacturer. During the course of use gaskets and other silicone parts may need to be replaced.Non-stick pot inserts are easily damaged and need to be regularly replaced.Cooks have reported electronic failures within the first three years of use. Though a few well-made models have lasted longer. Electric pressure cookers are often re-branded or imported as a one-time item so it may be difficult to track down replacement parts from non-established pressure cooker manufacturers. 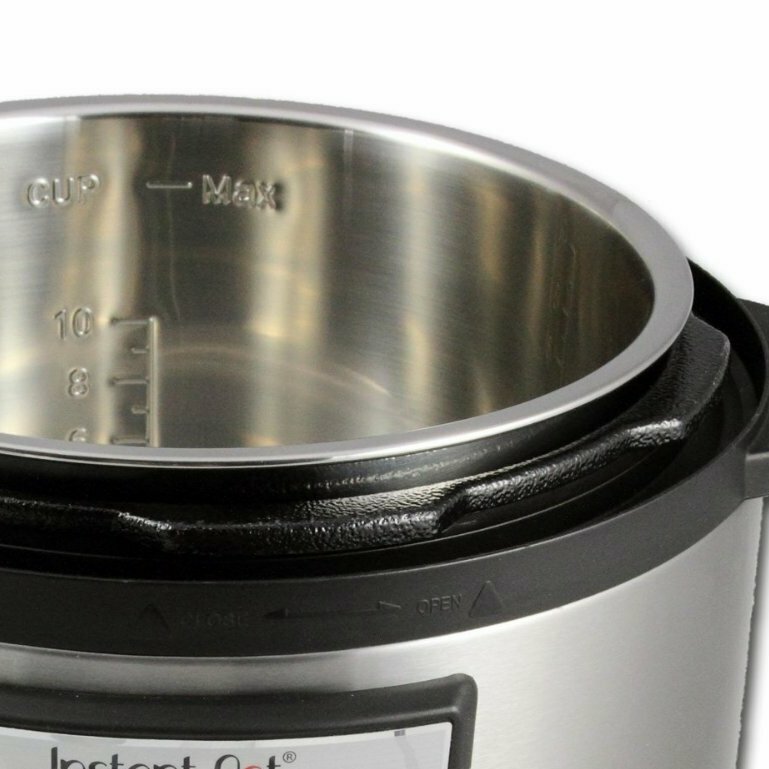 Although the time to pressure for a electric pressure cooker is just a few minutes longer than stove top (14 vs. 11 minutes)1 the natural pressure release takes more than twice as long (25 vs. 10 minutes) because the base cannot be removed from the heat source (the electric coil needs time to cool). Additionally the thermos-like double-walled construction of electric pressure cookers further insulates heat loss prolonging the time to open. However, the thermos-effect improves efficiency of the electric pressure cooker keeping the heat from the coil in the cooker and not dissipating it in the kitchen – making it 60% more efficient at using electricity than a similarly PSI’d stove top pressure cooker operating on an electric cooktop 2. The most tangible difference between stove top and electric cookers is the maximum pressure that can be achieved. While all modern stove top cookers adhere to the 13-15PSI standard, electric pressure cookers can vary greatly between manufacturers and models and are often below, or grossly below, the standard (with few exceptions). Lower pressure means that the cooker will need more time to achieve the same results as a stove top pressure cooker. Recommended cooking times and pressure cooker cookbooks will need to be adjusted – though they will still be briefer than cooking without any pressure at all! In my case, it made sense to trade the durability and power of a stovetop pressure cooker for the convenience of an electric. Even an automatic timer glued to the top of a stovetop pressure cooker or technological advances of newer stovetop pressure cookers introduced in 2016 – that include built-in thermometers, bluetooth communication, and apps – do not absolve the cook from the time needed to supervise the pressure cooker when it’s building pressure nor allow you to leave the house while any of this is going on. Ultimately, both electric and stove top pressure cookers will save energy, vitamins and time so the decision to purchase a stove top or electric pressure cooker is up to the individual cook. Do you already own a pressure cooker? Leave a comment to let us know what you like about it and if you have both kinds which one youuse the most. Images provided by Kuhn Rikon and InstantPot and used with permission. 1Timing based on multiple instances of bringing 6Lpressure cookers up to pressure while containing 1 kilogram (for stove top) or 1 liter (for 1000W electric) of ambient temperature water. I’m sorry to hear that you had a bad experience with an electric PC and couldn’t reach customer support – very frustrating, I’m sure. However I’m not sure that I’d use the term “diva”-style antics” to describe electric PCs. You apparently had a defective unit and that’s unfortunate, but it’s also true that thousands and thousands of folks have electric PCs and love them – especially those who have Instant Pots. Sometime do give electrics another try. And yes I appreciate what you’ve said about stovetop pressure cooking. Either way, pressure cooking is a great way to cook. Thank you for your encouragement, Sigrid. For me, for now, programmable PC’s are jumping the gun. Since I already have 2 stove top PC’s, that is where I plan to learn, and Laura’s website has resources to help me through that learning curve. It seems to me that if I master the stove top units, I will appreciate the “short-cuts” and multiple programs while also understanding more about the process involved. It’s great to have choices, including simple, basic ones! nice informative article. I don’t already own one, but really want to invest.I’m the type who likes to watch my food anyway, so stove top might be a good option for me, and later, if ever I decide I need to leave while cooking, I can purchase the electric one. You may or may not want an electric PC, but regardless of which you choose, you still can’t “watch your food.” Once under pressure, you cannot open the lid of an electric PC or a stovetop. With a stovetop, once the unit has come to pressure, you reduce the temperature to maintain the pressure. There’s little to do after that, other than occasionally glancing over to make sure the pressure is being maintained. However, with a bit of practice, you’ll know how to adjust the temp to maintain high pressure without monitoring. Of course with electrics, the PC will automatically adjust the temperature with absolutely no monitoring. Not talking about watching in the literal sense, like removing the lid. I’m just normally in the kitchen around the foods until they are finished cooking. which makes stove top not a problem , as for some people who would rather go out shopping for whatever when cooking. Good answer, I have always felt if your running the dishwasher, dryer, washing machine or cooking, one should be home to pay attention. Nag,nag,nag some of you, wait untill the taster catches fire under the cabinet. Other then my old 2 cents have fun and enjoy. Steve, I too use a stovetop PC. I love that I can use it while boon docking in my RV or at the camp site on my coleman stove. For that matter, using it when storms take out our electricity. No matter where I find myself, I’m able to make fast, nutritious, real food. Simple and delicious! I bought a Bella electric in 2016 at Christmas for$49. I liked learning how to use it and prepare meals and deserts. Fun ended when delay timer would not work. Bella refunded my money so I bought an Ellite 8 quart which is same size as Bella. Now all I have made is rice pudding, a compote, and corn on the cob. Just seems like I lost my enthusiasm for using it. My mom regularly used her stove top in the 50s and 60s. It once blew the pressure safety valve leaving green pea soup everywhere. Never will forget that. Mom also cooked cow tongue that tasted great. Nobody cares for that anymore. I told my wife to buy the toughest piece of beef she can find. If I succeed in making it tender, I will be able to use it more. Otherwise it will last a long time because I will avoid using it. Slow cooking is a lot easier and I have 5 of them.. I did successfully cook some regular pasta but gluten free pasta was mush. I have been thinking on brisket or pork shoulder in my IP8 Ultra. I’m also working on a time and water chart so I can SMOKE meat to 140f internal then finish in the IP. I love tongue! In particular, veal tongue, though beef is good as well. I like to cure it in salt for a couple of weeks before cooking it; it makes great sandwiches. I’ve never tried pressure cooking it though … I will do so the next time I make it. I have used a Fagor stainless steel stovetop pressure cooker and an electric Cook’s Essentials pressure cooker. Loved them both, however my electric one died within about 3 years. Since I gave away the Fagor, when it comes time for me to buy a new pressure cooker, it will be the Fagor stainless steel. It just seems a better fit for me. 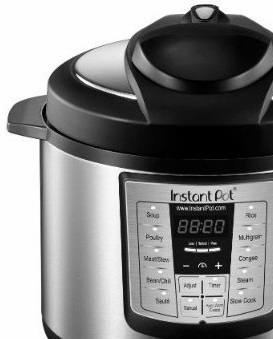 I have a 6 Qt 7-in-1 Instant Pot, which I’ve been using since April. Bought it to cook plant based recipes (e.g. grains & beans) more efficiently. But using it for meat based stews as well. I’ve been wondering if I should augment the IP with a smaller (3-4 Qt) stovetop PC for grains & smaller portioned dinners. Just my husband & I are there for dinner. We have a small galley kitchen and are starved for counter & storage space. Quite frankly the IP can be a real pain to set up. Also, I feel more comfortable cooking grains separately from other ingredients in most PC recipies. Also, I have a small travel trailer, and a stovetop pressure cooker would make more sense both sizewise, and for those times I camp without electric hookup. I’d appreciate your opinion if it makes sense as a quality stovetop PC costs several hundred dollars. Given that you prefer cooking grains separately from other ingredients, the new IP Mini sounds perfect for you. Oh thank you! so much. I had 2 stove top cookers in Colorado. Now retired to Florida, I ordered the electric version but haven’t unboxed it wondering if I really needed it. Of course I need it. All those times of pot watching and frustrating pressure relieving…over! Thank you. I love my stovetop pressure cooker. I have a duromatic stainless steel. My sister loves her electric one. I would like an electric cooker but don’t need a second. My sister has inserts that she uses for her electric. What kinds of inserts can I use for my stovetop. Makes me nervous. Can I put a stainless steel bowl, silicone bowl, pyrex, etc? Any risks? I would like to make rice . Or two things at once like a chicken stew and rice but separate. Make sense. I have a Duromatic too. Three actually. You can use any insert your sister uses. Provided they fit of course. Stainless steel, Silicone and Ceramic are all fine. Glass is fine too as long as it is heat proof. I haven’t actually used any Silicone products but I know others who have. As long as they are heat rated, they are fine. In summary, as long as it fits in and is heat proof it will be fine. I, too, love my stovetop. I did the research and decided that I didn’t need all the features of the multi-cookers, I just wanted a decent pressure cooker. I bought a Presto stainless steel pressure cooker and I haven’t looked back. I love it. Whatever I make is tender, juicy, and flavorful. While I didn’t expect it, I find pressure cooking to be fairly easy and very, very tasty. It’s definitely changed the way I cook for the better. Can I use my stovetop pressure cooker recipes in my electric pressure cooker? Do you have a book of just stove top recipes? Since I live in Utah which is high altitude will that make a difference? I bought a Mrs.Vickies book which is nice but some recipes are a little too much prep. Her website is no longer. Patricia, both my books and all my website recipes are designed for both stovetop and electric pressure cookers. It depends on your altitude, but take a look at my cooking time chart as at the top of it I give you the formula for adjusting cooking times based on your altitude (and, of course, all of the stovetop pressure cooking time for any ingredient you might think of). I forgot to note that I just purchased an 8qt instant pot duo. I have had a mirro pressure cooker for 40 years and wanted to try electric. I have done the water test but other than that, nothing. There were a couple of simple recipes from my mirro book that my family loves, and that I hope I can still make, I just don’t know if I need to do something different. As I look through recipes online, everything seems so gourmet or vegan or paleo, etc… I am none of those things, just a simple cook wanting to do things quicker and more efficiently, after all, I am old, retired and want to spend less time in my kitchen. I have 3 stovetop pressure cookers a 4,6 and 8 quart size, the 6 inherited from my mother. They would be the last pots I would ever give up. I use at least one size twice a week, Mom and mother in law used theirs every dinner for mashed potatoes. I’ve tried the insta pot and returned it. We have too many power outages to rely on electric and it took up too much real estate on my counter. I always make sure I have a gas stove so I was able to cook during week long hurricane power outages. Even used my Mirro on a campfire once. As I write this comment I’m using my 30 year old 8 to make soup stock. Susan, thanks so much for sharing your experience with us! Oh, the recipes that 30-year-old pressure cooker must have seen!! I would never go to electric for the exact reason you list…a stove top unit will last forever. I also have 3- Mirro cookers-my mom’s 4-qt from 1940’s; 16 qt ( ‘new’) from 70’s I use for canning season and large batches of soups and stews for our local food pantry in the cold months; and 6-qt ( 60’s?) my daughter found free at antique shop! ( I also ‘can’ small batches during the year of stuff in 4 or 6 qt ones) I keep a supply of fuses, and a couple of extra gaskets in case they ever stop the availability- I just love them for everything. If I could only keep just one piece of cookware to equip my kitchen, it would definitely be one of my Mirros! I don’t know of any stovetop pressure cooker recipe that calls for “medium”. Can you link to the recipe? In T-FAL “QUICK AND EASY COOKING WITH JAMIE OLIVER” RECIPES book on your website, it says on some of the recipes to turn down to medium. These are instructions for their stove-top pressure cooker, if you’re using an electric you wouldn’t need to adjust the flame. However, be aware that if their timing in the recipe booklet is given for their “vegetable” setting it is the equivalent of “low pressure” on most cookers. Hi, I just ordered a Cuckoo Multi Cooker. Just wondering if I use my Pressure Cooker cookbook, which is for stovetop pressure cooker, will the recipes turn out okay? There are lots of Instant Pot recipes online, will they be useable fir the Cuckoo brand electric mu,it cooker? Thank you. I have a stovetop pressure cooker and love it. Thanks for sharing your videos. I just had a look at the instruction manual for the Cuckoo Pressure Multi Cooker, is that the one you have? It’s soooo cute! Especially how they call the lid “Assy” in the manual. But seriously, the pressure cooking program operates at the same pressure as Instant Pot so you’re good. Have fun with your new cooker! I love my electric PC for everything so far except artichokes. It doesn’t matter how much extra time I add, they are never cooked enough. I am sticking with my old stove top for them from now on. I will never get rid of my stove top PC’s. Love them both! It would be a great help to see a video with side by side demonstrations showing a stove top vs electric pressure cooking. For example: Cooking a whole chicken in both start to finish. 1. How long does it take to come up to pressure. 2. How long it take to complete the cooking. 3. How long it take for natural release. That’s a great idea. Since Zavor re-released their improved “Duo” stovetop I’ve been thinking of ways of showing it off. This may be one of them. I find that my Instapot is too complex with all the automatic settings. I never use those settings on my microwave either. I would rather load the ingredients like a conventional stovetop cooker instead of wondering, should I set it to soup? Chicken? The little secret is that all the settings behind those food-specific buttons are the same – except for the recommended time. I live at 7000ft and need every last extra PSI I can get, so this rules out electric cookers for me. My stovetop pressure cookers are kitchen workhorses in constant use for everything from preparing dried beans, getting root veggies cooked quickly, and making delicious one-pot meals. They can even be used for “foaming” foods such as pasta and rice if you are careful about using enough oil to control the foam. I wore out my original aluminum cooker and now own two different sizes of stainless steel. With more and more IP recipes popping up in magazines and websites, I am debating whether to give any of them a try; my best guess is that I’d have to use the low pressure setting (~8PSI, referred to as “medium” by some stovetop cooker manuals) on my stovetop cooker to match the IP timings. Haven’t tried it yet. All pressure timings, presumably including those for an IP, need to be adjusted upward at high altitudes. At 7000ft, sea level pressure cooking times must be increased by 25%.